Several years back, the monumental task of recommending an optimal diet for type 2 diabetics was assigned to Dr. Richard Kahn, then the chief medical and scientific officer of the American Diabetes Association (ADA). Like any good scientist, he began by reviewing the available published data. “When you look at the literature, whoa is it weak. It is so weak”, he said. But that was not an answer that the ADA could give. People demanded dietary advice. So, without any evidence to guide him one way or the other, Dr. Kahn went with the generic advice to eat a low fat, high carbohydrate diet. This was the same general diet advice given to public at large. The United States Department of Agriculture’s food pyramid would guide food choices. The foods that formed the base of the pyramid, the ones to be eaten preferentially were grains and other refined carbohydrates. These are the exact foods that caused the greatest increase in blood glucose. This was also the precise diet that failed to halt obesity and type 2 diabetes epidemics in generations of Americans. Let’s juxtapose these two incontrovertible facts together. Type 2 diabetes is characterized by high blood glucose. Refined carbohydrates raise blood glucose the most. Type 2 diabetics should eat the very foods that raise blood glucose the most? Illogical is the only word that comes to mind. This happened, not just in the United States, but around the world. The British Diabetes Association, European Association for the Study of Diabetes (EASD), Canadian Diabetes Association, American Heart Association, National Cholesterol Education Panel recommend fairly similar diets keeping carbohydrates at 50-60% of total calories and dietary fat at less than thirty percent. The 2008 American Diabetes Association position statement on nutrition advised that “Dietary strategies including reduced calories and reduced intake of dietary fat, can reduce the risk for developing diabetes and are therefore recommended”. The logic is hard to follow. Dietary fat does not raise blood glucose. Reducing fat to emphasize carbohydrates, known to raise blood glucose could protect against diabetes? How they believed that would work is unknown. It further advised, against all common sense that “intake of sucrose and sucrose-containing foods by people with diabetes does not need to be restricted”. Eating sugar was OK for type 2 diabetics? This could not realistically be expected to lower blood glucose, and the proof came soon enough. The 2012 Treatment Options for Type 2 Diabetes in Adolescents and Youths (TODAY) randomized study reduced caloric intake to a miniscule 1200-1500 calories per day of a low-fat diet. Despite this massive effort, blood glucose was not improved. This classic ‘Eat Less, Move More’ strategy failed yet again, continuing its perfect record, unblemished by success. That this diet would not work should have been fairly obvious from the beginning. A comprehensive review in 2013 concluded that several different types of diets did in fact provide better glycemic control. Specifically, four were found beneficial – the low carbohydrate, low glycemic-index, Mediterranean and high protein diet. All four diets are bound by a single commonality – a reduction in dietary carbohydrates, and specifically, not a reduction in dietary fat, saturated or otherwise. Low-fat diets were falsely believed to reduce cardiovascular disease. A recent review by Dr. Zoë Harcombe found no evidence to support this contention . Indeed, five separate prospective trials since the 1960s have failed to find any relationship between dietary fat and cardiovascular disease, including the Puerto Rico Heart Health Program and the Western Electric Study. The Nurse’s Health Study, once adjusted for trans-fats, found no relationship between dietary fat or dietary cholesterol and heart disease. Despite forty years of studies trying vainly to link dietary fat, dietary cholesterol and heart disease, still not a single shred of evidence could be found. The final nail in the coffin was the 2006 Women’s Health Initiative, the largest randomized dietary study ever undertaken, which proved this notion false. Almost 50,000 women followed this low-fat, calorie-reduced diet for over 8 years. Daily caloric intake was reduced by over 350. Yet the rates of heart disease, stroke did not improve whatsoever. Neither did this calorie-reduced diet provide any weight loss. Despite good compliance, the weight difference at the end of the study was less than ¼ pounds despite years of caloric restriction. There were absolutely no tangible benefits to long-term compliance to a low-fat diet. In diabetics, the story was the same. The Action for Health in Diabetes (LookAHEAD) studied the low fat diet in conjunction with increased exercise. Eating only 1200-1800 calories per day with less than 30% from fat, and 175 minutes of moderate intensity physical activity, this was the recommendation of every diabetes association in the world. 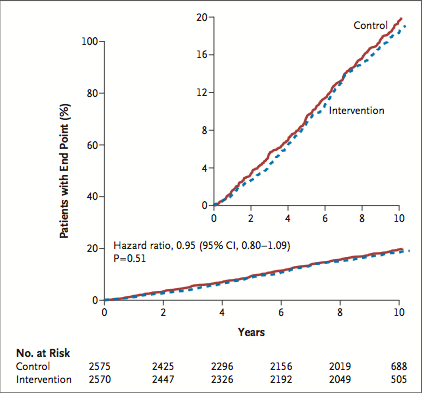 Would it reduce heart disease as promised? Hardly. In 2012, the trial was stopped early due to futility after 9.6 years of high hopes. There was no chance of showing cardiovascular benefits. The low-fat calorie-reduced diet had failed yet again. Lifestyle interventions, typically a combination of diet and exercise, are universally acknowledged as the mainstay of type 2 diabetes treatments. These two stalwarts are often portrayed as equally beneficial and why not? Exercise improves weight loss efforts, although its effects are much more modest than most assume. Nevertheless, physical inactivity is an independent risk factor for more than 25 chronic diseases, including type 2 diabetes and cardiovascular disease. Low levels of physical activity in obese subjects are a better predictor of death than cholesterol levels, smoking status or blood pressure. The benefits of exercise extend far beyond simple weight loss. 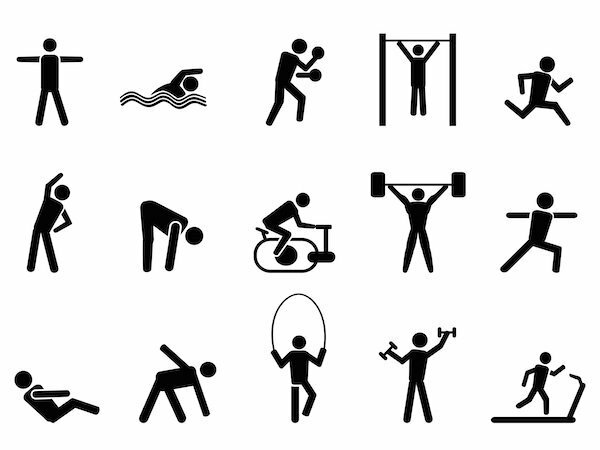 Exercise programs improve blood pressure, cholesterol, blood glucose, insulin sensitivity, strength and balance. Exercise enhances insulin sensitivity, without involving medications and their potential side effects. Exercise has the added benefit of being low-cost. Trained athletes have consistently lower insulin levels, and these benefits can be maintained for life as demonstrated by studies on Masters’ level athletes. Exercise programs have proven themselves in obese type 2 diabetics as well. Yet results of both aerobic and resistance exercise studies in type 2 diabetes are varied. Some show benefit for A1C, but others do not. Meta-analysis shows significant reduction in A1C, but not in body mass, suggesting that exercise does not need to reduce body weight to have benefits. Despite all the benefits of exercise, it may surprise you to learn that I think that this is not useful information. Why not? Because everybody already knows this. The benefits of exercise have been extolled relentlessly for the last forty years. I have yet to meet a single person who had not already understood that exercise might help type 2 diabetes and heart disease. If people already know its importance, then what is the point of telling them again? The main problem has always non-compliance. The spirit is willing but the flesh is weak. This is only more of the game of ‘Blame the Victim’. A myriad of issues may deter an exercise program. Obesity itself, joint pain, neuropathy, peripheral vascular disease, back pain, heart disease may all combine to make exercise difficult or even unsafe. Overall, I suspect the biggest issue is lack of results. The benefits are greatly overhyped and exercise doesn’t work nearly as well as advertised. Weight loss is often minimal. This lack of results, despite great effort is demoralizing. Conceptually, exercise seems an ideal way to burn off the excess ingested calories of glucose. Standard recommendations are to exercise 30 minutes per day, five days per week or 150 minutes per week. At a modest pace, this may only result in daily 150-200 kcal of extra energy expenditure, or 700-1000 kcal per week. This pales in comparison to a total energy intake of 14,000 calories per week. A single day of fasting creates a 2000-calorie deficit, without doing anything! There are other well-known limitations to exercise. In studies, all exercise programs produce substantially fewer benefits than expected. There are two main mechanisms. First, exercise is known to stimulate appetite. This tendency to eat more after exercise reduces expected weight loss and benefits become self-limiting. Secondly, a formal exercise program tends to decrease non-exercise activity. For example, if you have been doing hard physical labor all day, you are unlikely to come home and run ten kilometers for fun. On the other had, if you’ve been sitting in front of the computer all day, that ten kilometer run might start sounding pretty good. Compensation is a well-described phenomenon in exercise studies. In the end, here’s the main problem. Type 2 diabetes is not a disease that is caused by lack of exercise. The underlying problem is excessive dietary glucose and fructose causing hyperinsulinemia, not lack of exercise. Exercise can only improve insulin resistance of the muscles. It does not improve insulin resistance in the liver at all. Reversing type 2 diabetes depends upon treating the root cause of the disease, which is dietary in nature. Imagine that you turn on your bathroom faucet full blast. The sink starts to fill quickly, as the drain is small. Widening the drain slightly is not the solution, because it does not address the underlying problem. The obvious solution is to turn off the faucet. In type 2 diabetes, a diet full of processed grains and sugar is filling our bodies quickly with glucose and fructose. Widening the ‘drain’ by exercise is minimally effective. The obvious solution is to turn off the faucet. If the underlying cause of the disease is not lack of exercise, increasing it will not address the actual cause of the problem and is only a Band-Aid solution at best. Most of the “official” medical websites refuse to look seriously at the abundance and quality of scientific evidence. I was reading an endocrinology website yesterday… same thing. I guess it took ages for people to understand the world was not flat. Unfortunately, the health of millions around the world is at stake. We’ve all seen bad nutritional advice many times, but claiming that fat is what makes blood glucose rise is beyond the standard level of badness. It’s downright insane, and you don’t even need science to know it, anyone with cheap equipment can test it for themselves. I’ve tested my blood glucose thousands of times, and I’m not even diabetic. So what is the solution then? Fasting? Fasting plus low carbohydrate way of eating. I do keto, but different strokes for different folks. Exercise is great to build muscles and body mass as it makes us hungry! Drinks with fructose makes as fat after a while as fructose reduces insulin sensitivity, so that the sugar in a sugary drink can make us obese!. Tim Noakes is the best example I know of a healthy athlete that after 50 in spite of daily runs gradually found himself gaining weight and had become pre-diabetic! He reversed it and wrote a few books about it, one called The Lore of Nutrition! Fat is the real friend! How do we know if we have insulin resistance in the liver? My three factor answer is: being overweight with a high fasting glucose level and a high triglyceride level. Pages 164-165 in the Obesity Code is a good place to start to understand why. You could just have dawn phenomenon…..or an outlier reading. Need more data points including tg to hdl ratio. Throw in hypertension or pre hypertension…. Overweight is probably not a good part of definition….a little to ambiguous. Traditionally, BMI is used or waist circumference. BMI problematic but better indicator in sedentary younger to middle age. Waist circumference might be preferred. All of this stuff….with caveats. Good for you. I am the same. But diabetes appears frequently in both mothers and fathers ancestors and families. Fasting, yoga, weight lifting, cardio, and keto way of eating for me. I am 70. So far so good. Good luck to you. Great post Dr Fung. Wonderful what you do for everyone in the world. Thanks so much. The sugar and rice diet? I understand that mixing nutrients appears to be the issue for some unknown biochemical reason to me. Sugar does not nourish anybody in any way, though… That diet sounds like nutritional suicide nowadays. LOL. When you separate carbs/fats, the foods themselves are self regulating. When you combine carbs/fats, the regulation is defeated and bubbles up to the society and family customs/norms to regulate. And when that is destroyed then it bubbles up to the govt. It would seem you might benefit from holding off on extended fasts and limiting to a couple days or less……and seeking extended fasts only starting with medical supervision by a practitioner with experience in extended fasts. Synthroid powerful stuff and you could be jeopardizing your health by fasting without supervision. Do not underestimate the contribution of exercises to our health… it’s not just the more calories we spend, it’s a turn on energy “switch” like in car shifts… the illustration in the link demonstrates the idea – when showering, it’s much faster to get rid of soap when more water are running… Thus it’s easier to repair maladies when the body “knows” energy is abundant, and this is what exercising signals. 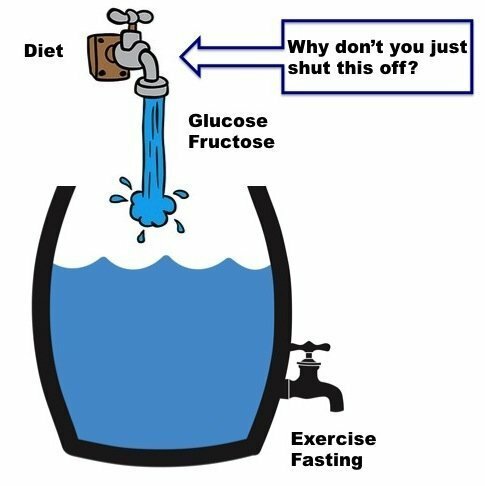 Not only does 24 hrs of fasting create 2000+ calorie deficit, it also creates a monster sized insulin deficit allowing the gates of fat to be open to be burnt. That insulin deficit is what is the key factor in being able to burn fat. Just remember to cycle in some LCHF days. Living long term without much fats will pull you in a bad direction as well. We need both. Just not at the same time. Sorry, but a lot of healthcare providers (especially nutritionists) are still dishing out the old low-fat, food pyramid, “eat less, move more” dietary advice (the advice that in my opinion drove two of my diabetic grandparents to early graves). A lot of doctors are getting hip to eating low-carb as a valid healthy diet, but some are still stuck to the old dogma, even today. They might have changed “refined” to “whole-grain”, and they might say it’s okay to eat an avocado or two, but the advice is pretty much the same. Meu sogro tem esse problema e foi bom ter mais conhecimento sobre o assunto,gostei demais, foram tantas dúvidas que tirei neste poste, parabéns trabalho excelente.